The highly anticipated xianxia drama Hua Xu Yin: City of Desperate Love <华胥引之绝爱之城> is finally arriving. After four years of preparation, filming, and delayed schedules, the tragic fantasy will finally be premiering on Jiangxi TV, Sichuan TV, and Anhui TV on July 9, 2015. QQ.com has also purchased the exclusive rights to premiere it online at the same time. Hua Xu Yin: City of Desperate Love is adapted from the best-selling novel Hua Xu Yin by Tang Qi Gong Zi (唐七公子). 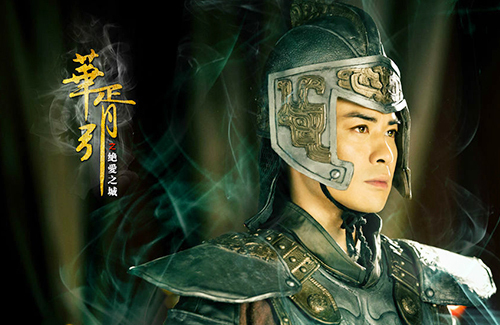 Starring Kevin Cheng (郑嘉颖), Lin Yuan (林源), Jiang Xin (蒋欣), and Yuan Hong (袁弘), the xianxia drama is about the dream weaver Jun Fu, a resurrected princess, and her inspiring but tragic love story with Mu Yan, the reluctant Crown Prince for the Kingdom of Chen. Ciwen Media purchased the rights to adapt Hua Xu Yin in 2011, but the script took over two years to write due to the long length of the novel. After over 20 revisions, production was finally ready to start in January 2013. Originally slated to complete filming by May 2013, the shooting duration was extended to the end of June due to Kevin Cheng’s busy schedules. At the time of completion, Ciwen Media announced that the series was aiming for an August 2014 premiere. After a change in drama airing schedules and a chaotic post-production, Ciwen Media finally confirmed this month that Hua Xu Yin would premiere on July 9, 2015, over four years after its conception. Hua Xu Yin: City of Desperate Love is one of Mainland China’s most expensive and grand dramas to-date, costing over 100 million RMB; the CGI, costumes, weapons, and artistic departments comprised of the same teams that worked on The Legend of Zhen Huan <甄嬛传> and the Tsui Hark (徐克) film Detective Dee and the Mystery of the Phantom Flame <狄仁杰之通天帝国>. what is xianxia? and what are the characters? @mosailan Correct me if I am wrong. Xianxia is fairy (not gay) themed series, aka fantasy elements set in ancient times. Like Journey Of Flower, with beasts and immortals and fantasy elements. @funnlim I see. Like Journey to the West? I never heard of the term before so I was a bit confused. Me too. I grew up watching those series although I rather watch the HK version than the Mainland China ones. @mosailan I believe so except I wouldn’t say JTTW is termed as xianxia strictly. I suppose this new sort of def which has been around but now used to differentiate with wuxia series. I would say it means fantasy series and by fantasy I mean with magic and such. Or immortals or undeads. This series sounds interesting but is Kevin’s presence a curse or a blessing? Right now you can watch Journey Of Flower for this sort of series except for a fantasy series (deities, magic, beasts etc) the effect is god awful and the kung fu is just boring. The acting however and the idea of the two main characters is the driving force. I suppose not telling us how old BZH is is a way to circumvent the idea of a very old dude with a very young mortal girl. Of course none of these series ever really address the issue of old age for the mortal girl. My assumption of immortals are carefree, an eternity of life but this series depict immortals as mostly miserable. What an eternity to live. JTTW, FSB belong to the Myths and Legends (shen hua) which are classic stories of how the world was formed and how order was created or restored in the world. Humans or lower level immortals often overcome drastic hurdles to reach enlightenment. These stories portray most gods and deities in a good light and better than humans. They have happy endings. Xian xia stories are a new genre that combine wuxia and myths. They can have some old-school immortals, but mostly are focused on newly created characters and how they overcome evil and bring peace tot he world. These immortals tend to be romantic and have lots of human traits and are portrayed to have human weaknesses, or sometimes even worse than humans. They have mostly have miserable endings. Okay, that makes more sense. Thanks for the explanation!